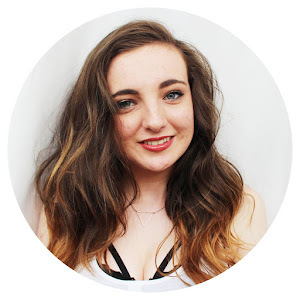 I decided that it was about time I showed you what I use on my hair/body on a daily basis. I didn't want to do a full morning routine, or a full night one, but I did want to show something. 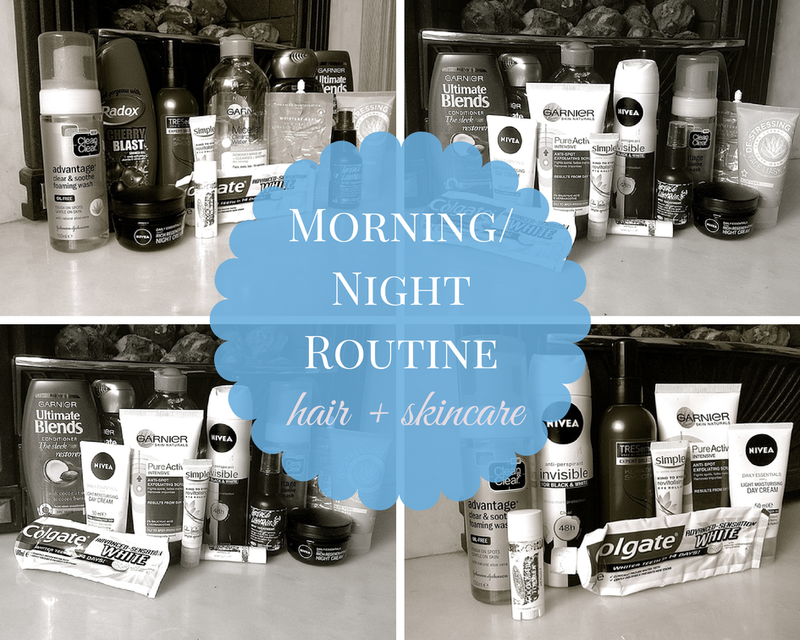 This is why I chose to do a morning/night routine - the hair and skincare edition! So lets go! In the morning, after I have breakfast, the first thing I do is brush my teeth. I chop and change toothpaste all the time, but at the moment i'm using the "Colgate Advanced Sensation White". It's okay, but it hasn't really made my teeth any whiter, but i've yet to find one that does. Once or twice a week I like to use a face scrub, and the one i've been really liking is the "Garnier Pure-Active Anti-Spot Exfoliating Scrub". Much like the face wash, this is good at getting rid of blemishes, and it leaves my skin feeling so soft! I couldn't use this more than twice a week as I think it would definitely dry out my skin. I then go ahead and put on eye cream, and I am using the "Simple Revitalising Eye Roll-On". This is really soothing under my eyes, and it's okay at reducing puffiness, although it's not great at actually making those horrible dark circles disappear. The lip balm I use is one i've been going back to for years. It's the "Palmers' Cocoa Butter" one, and it is amazing. So moisturising, and it smells delicious! A definite must-have for me. For my hair, I tend to straighten it most days, although sometimes I do just braid it the night before, and undo it the next day and voila, hair is done. One product I use before I brush my hair is the "Tresemme Keratin Smooth Heat Protecting Spray". Not only is it a heat spray, but as it has Keratin in it, it means it's amazing at detangling my hair! I've done a full review on my blog, which you can read here. I then of course use deodorant, and I use "Nivea Invisible Black and White" one. It does the job. There isn't much more I can say about a deodorant! 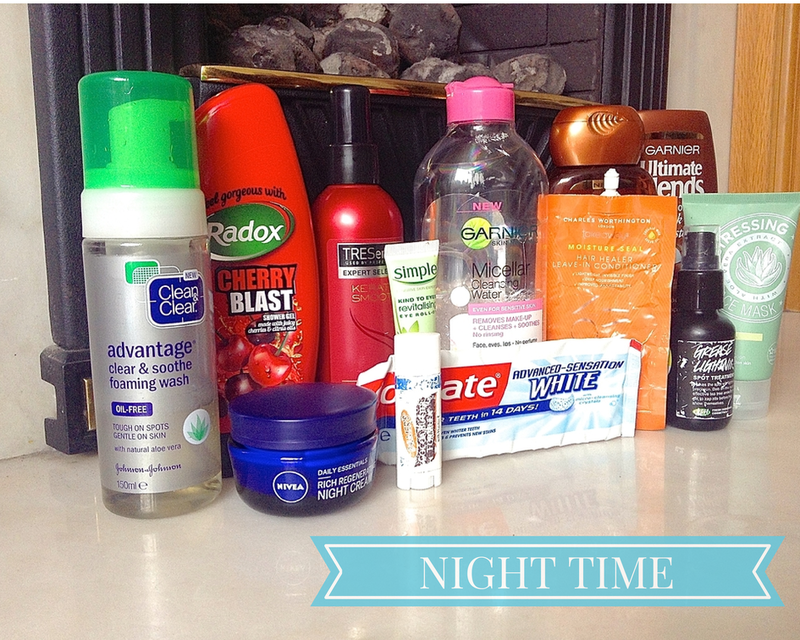 As you can see, some of the products I use at night are the same as those I use in the morning. I'll quickly run through why I use these. The face wash and eye cream are just great both morning and night, as they are gentle enough, and I really like them. The toothpaste I keep the same, obviously. I also use the same lip balm, because it is my holy grail product. I am a night showerer. I have such long, thick hair that it is an absolute nightmare to wash, which is why I do it when I have the most time, which happens to be at night. I am currently using the "Garnier Ultimate Blends Shampoo and Conditioner The Sleek Restorer" in the coconut scent. I'm not a huge fan of the smell, but it does wonders to my hair. I also change around my body wash all the time, and at the moment I have the "Radox Cherry Blast Shower Gel" and I am in love with the smell of this! (Cherries are one of my favourite things.) It also lathers up really well. I really recommend it. After I come out of the shower I use the "Tresemme Heat Spray" like I use in the morning, just to protect my hair, and help detangle it. Once a week I will use a leave in conditioner in my hair, and the one I have absolutely been loving recently is the "Charles Worthington Moisture Seal" one. It smells really nice, and it leaves my hair feeling so soft. Also once a week I like to use a face mask, and this "Superdrug Aloe Vera Mud Mask" is so good! And it was only around £3! Absolute bargain. It makes my skin feel amazing. To take off my makeup I love the "Garnier Micellar Water". It's just amazing. It's so gentle on the skin, and it takes off everything, all for under a fiver. The only part of my skin routine I change at night is that I use the "Nivea Rich Regenerating Night Cream". It's basically a heavier version of the day cream, leaves my skin feeling really soft, but takes ages to sink into the skin. I also use a spot cream, because I have really bad skin. I've tried countless creams, and the only one i've found to work on most spots (again, not the hormonal ones, sorry!) is the "Lush Grease Lightning". It's a much raved about product in the blogging world, and I can see why. It's really good. And that's everything I use in the morning and night times! Have you tried any of the products i've shown? Please let me know, i'd love to hear what you think of them! Or if you have any recommendations (maybe for moisturisers?) then let me know that as well! I always love morning and night routines! I've really been wanting to try the Lush Grease Lightning! I love them too! You definitely should try it out, it's not too pricy, and it lasts FOREVER. Thank you! I know, I think so many people forget just how important taking care of your skin is! Thanks for your comment! 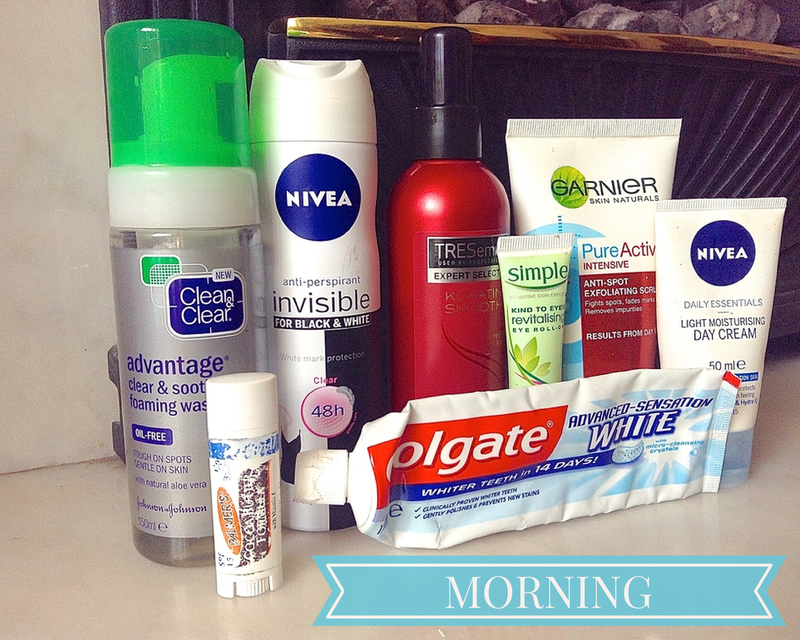 This was a very helpful post as I am defiintly trying to amp up both my am and pm routines! Very good timing! Love your blog and I am following! Please visit me too at http://melissygoose.blogspot.com/ Thanks for letting me read!